Santaluz is a community of undulating, rolling hills located within the picturesque San Dieguito River Valley adjacent to Fairbanks Ranch and Rancho Santa Fe. The Santaluz homes for sale are all part of an exclusive 3,800 acre, master-planned, gated community, and offer some of the best aerial views of the Pacific Ocean and mountains in San Diego County. The centerpiece of the community is the 250 acre, 18-hole, championship golf course designed by Rees Jones. Not only is the course challenging, but the landscape architecture inherent to the fairways and greens is spectacular. Santaluz is also very conveniently located only 10 minutes from the coast and 20 minutes from Downtown San Diego. View more about Santaluz on Pinterest! 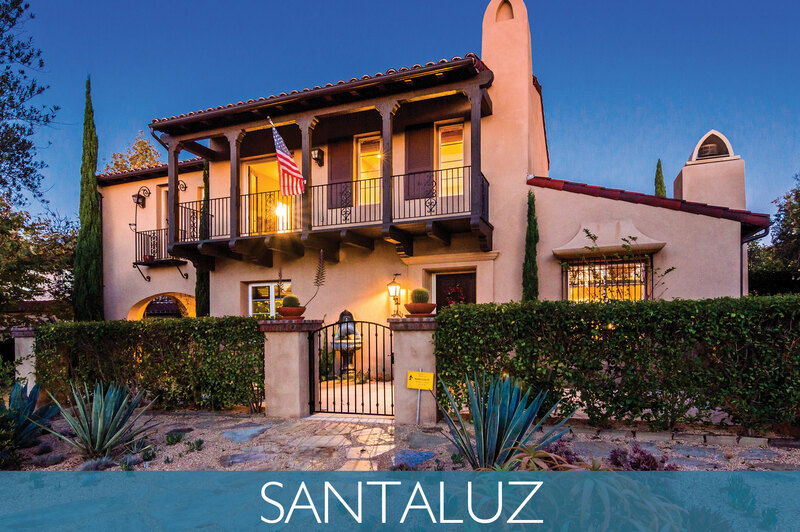 Homes in Santaluz are reminiscent of European farmhouses, adobe ranches, and Monterey estates. Many are comprised of rustic timber and reclaimed stone providing true quality and distinction. Custom, circular, one-acre homesites, averaging four acres apart, allow for homes to be built at any angle and location within the site maximizing views and privacy. Half of the community is reserved for open space and there are more than 44 miles of private, manicured hiking and biking trails that take full advantage of it. There is also the Santaluz Village Green comprised of 11 acres of manicured lawn reserved to be used for community activities including live, summer music concerts, picnics, and more. Santaluz properties surround the prestigious, membership-only, Santaluz Club. In addition to the Rees Jones golf course, there is a 35,000 square foot Clubhouse and world class Spa featuring dining options, a golf shop and separate men’s and woman’s lounges. In addition, there is a 19,000 square foot Hacienda that serves as the recreational center for the community and homeowner’s association headquarters. It features a coffee house/café, resort-like swimming pool, six tennis courts, state of the art fitness center, full indoor basketball court, gymnasium, massage treatment and therapy room, and pro-shop. For the children, Camp Santaluz offers a variety of recreational and educational activities throughout the year.